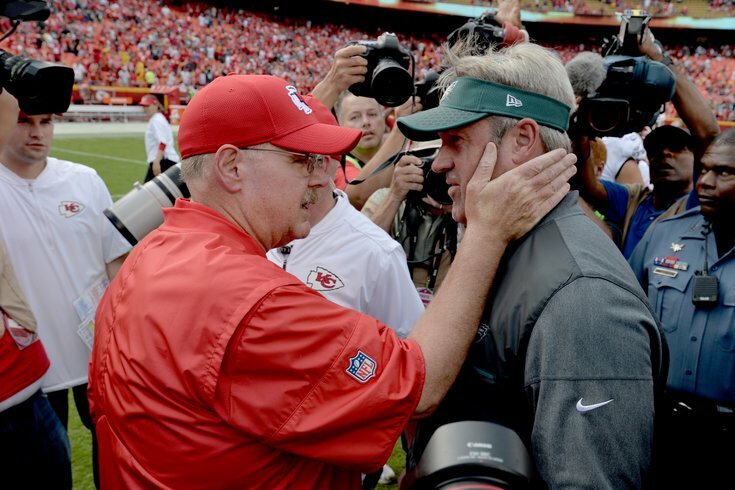 The Andy Reid basics of roster building have continued in Philly even after his departure. Question from Kimmy Jempski: Why do people keep using the argument, "Oh the Eagles haven't drafted a RB, or a S, since 19xx"? I mean, is not like not drafting those players in the first round had given the Eagles multiple championships. Shouldn't the Eagles change that way of drafting? I answered this question briefly in the chat, but wanted to expand on it a bit. Ever since the Andy Reid era began in Philadelphia, the Eagles have very clearly placed heavy importance on some positions over others. I want two offensive tackles, a quarterback, two pass rushers, two corners, and I’ll figure the rest out. Of course, once Donovan McNabb was drafted, the quarterback position didn't need to be addressed for a long time, and the same went for Tra Thomas / Jon Runyan (and later Jason Peters) at offensive tackle, as well as the transition from Troy Vincent / Bobby Taylor to Lito Sheppard / Sheldon Brown at corner. So the team loaded up on pass rushers, whether they be at defensive end or defensive tackle, with varying success on hits and misses. They stayed true to that roster-building formula, and while they never won a Super Bowl, the Eagles had, in my opinion, one of the top 5 teams in the league over the span from 1999 to 2012. *The Eagles drafted Roynell Young in the first round in 1980, but he started his career as a corner, and eventually moved to safety. I know there are a lot of fans who would love to see the Eagles draft a running back or a linebacker in the first round of the 2019 NFL Draft. Don't hold your breath. • Quarterback: Carson Wentz was the MVP of the league before he got hurt. When he got hurt, the was replaced by one of the highest-paid backup quarterbacks in the league, in Nick Foles. In fact, the Eagles valued quarterback so much that they ate a ton of dead money on Chase Daniel's bad deal to bring in Foles, when it would have just been easier to ride it out with Daniel. • Offensive tackle: Jason Peters was acquired via trade, and the cost of a 1, a 3, and a 6 was high, but obviously worth it. Lane Johnson was the fourth overall pick in 2013. They were the best tackle tandem in the NFL, by far, before Peters went down. And when he did go down, the Eagles had a competent backup who could step in. Fletcher Cox was the 12th overall pick in 2012. Brandon Graham was the 13th overall pick in 2010. Derek Barnett was the 14th overall pick in 2017. Vinny Curry was a second-round pick (59th overall) in 2012. They signed Chris Long, a former No. 2 overall pick. • Cornerback: The corners certainly weren't anywhere near as good as the rest of the positional groups above, but it wasn't for a lack of trying. The Eagles gave out big-money contracts to some guys who flopped, and were shipped out. They did use second- and third-round picks on corners in the 2017 draft (Sidney Jones and Rasul Douglas), and traded a third-round pick in 2018 for Ronald Darby. The Eagles' positional-building strategy isn't changing anytime soon, nor should it. Question from birdgang: Given that Nate Sudfeld is making $3 million this year, do you really think they’ll bring in a veteran who has the chance to unseat him as the No. 2? I mean, $3 million would be a ton of money to pay a third-string quarterback. Sudfeld is the No. 2. All the veteran backup quarterbacks worth signing have already landed somewhere else, and it didn't appear as though the Eagles had interest in any of them before they did. Question from Taco J: More likely scenario: Halapoulivaati Vaitai gets traded during the draft, or he walks after this season and the Eagles get a comp pick for him? I think it’s the latter. Offensive linemen – even backups – get stupid money in free agency. Take Ty Nsekhe this offseason, for example. He played a similar role for Washington that Vaitai does for the Eagles, and Nsekhe got a two-year deal worth $10 million. And he turns 34 in September! Another player I can remember playing a similar role as Vaitai in the NFC East was Jermey Parnell for the Cowboys. He left for the Jaguars in 2015 for a five-year deal worth $32 million. At the time, that was a contract big enough to earn the Cowboys a fourth-round comp pick. Without going too far down the rabbit hole on this, I’m sure there are more examples. But if I’m Vaitai, I’m probably looking forward to testing the open market in 2020, and if I’m the Eagles, I’m probably not meeting the demands that Vaitai would be smart to have. Question from Norm Snead: Assuming he is healthy, how viable is Josh Sweat as the Eagles’ No. 3 DE? No. 4 DE? He's not viable as either as this point. Sweat entered the league as an athletic freak of nature with serious injury concerns. He suffered an ankle injury in December that was serious enough to land him on injured reserve, when the Eagles were already light on defensive end depth. He can't be counted on as anything more than a fifth defensive end who the team will try to develop behind the scenes, and only playing when absolutely necessary. Question from birdgang: Who is your under-the-radar pick for the “his roster spot is not as secure as most people think” award? I’d say Mack Hollins and/or Josh Sweat. I think Mack is safe. He’s a core special teamer, so as long as he’s healthy, he’ll play. If he isn’t healthy, they’ll just put him on PUP, or IR him if he’s hurt during the season. But there’s no real reason to cut him yet. I don’t think there’s really a great candidate for that award this year. If I had to pick one, I’d say Nelson Agholor. If the Eagles draft a receiver, for example, or a guy really steps up in training camp and shows that he can be a good slot guy, then I can see a scenario where they try to trade Agholor for pretty much anything to get his $9-plus million off the books. To note, they can’t cut him at this point, because his contract is fully guaranteed, and he’d cost you the full salary cap hit anyway. But if they traded him, there’d be no penalty. Question from Pete: Should I be mad at Donnel Pumphrey for being bad, or mad at the draft evaluators that selected him? The latter. Pump is a good kid. It’s not like there’s a lack of effort or some other attitude or personality issue, as far as I know. Like, if you want to be mad at Danny Watkins for being a con artist who played for money but really had no interest in winning or becoming a good player, go right ahead. Or Marcus Smith, who laughably skipped OTAs. Those are the guys who deserve scorn. Question from Bob: Jimmy, how can we fans be expected to attend home games at the Linc now that our president has informed us that wind turbine noise is carcinogenic and those death machines are perched menacingly atop the stadium? When I first read this question, my first reaction was, "Huh?" But after a quick Google search, GOOD LORD! Warning: Do not watch the following video. If you look directly at the solar panels, you will go blind. Question from Lt. Aldo Raine: Bold strategy: Draft identical twins to play WR and give them the numbers 18 and 81, thus taking advantage of any dyslexic CB. What do you think? I’m failing to see the advantage. Assuming the identical twins have a very similar skill set, as I imagine they would, the dyslexic CB is basically just going to be covering the same guy anyway, whether 18 or 81 is in the game. Question from Southwestern Man: How was the hike in Sedona? Got any photos you can share? Yes, so, after the NFL owners meetings concluded in Phoenix, I went to Sedona for a couple days. It's like an hour and a half drive, and if you're ever out that way, I highly recommend it.